"I don't expect to be in the room or will I do anything to prevent you from obtaining a contraceptive," Martin wrote. "However, once a child does exist in your womb, I'm not going to assume a right to kill it just because the child's host (some refer to them as mothers) doesn't want it." Martin then changed his post on Monday afternoon to refer to the woman as the "bearer of the child" instead of the "host." Scroll down to see a screenshot of Martin's original post. Martin voted for Virginia's mandatory ultrasound bill and supported a fetal personhood bill, which would ban all abortions and could affect the legality of some forms of contraception. The Virginia Pro-Choice Coalition had sent him a Valentine's Day card asking him to protect women's reproductive health options, "including preventing unwanted pregnancies, raising healthy children and choosing safe, legal abortion." Martin reacted strongly to their letter. "If it's your expectation that I should support such nonsense, I will be breaking your heart," he wrote. "You can count on me to never get in the way of you 'preventing an unintentional pregnancy.' I'm not actually sure what that means, because if it's 'unintentional' you must have been trying to prevent it." Martin said Monday that he edited the original wording calling women hosts because people took it the wrong way, even though he felt it was clear he was being sarcastic. "I don't see how anyone could have taken it the wrong way," he said. "It was me playing their argument back to them. Obviously I consider pregnant women to be mothers." 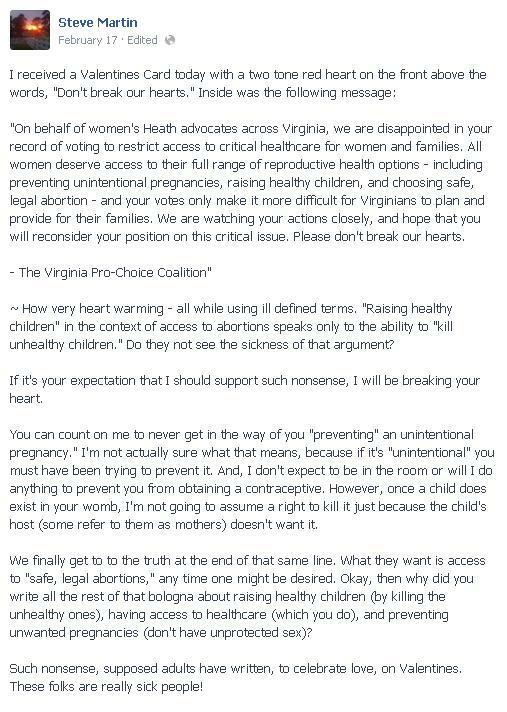 Tarina Keene, executive director of NARAL Pro-Choice Virginia, told The Huffington Post in an email that Martin's rant reveals the "contempt" that anti-abortion lawmakers have for women. "Sen. Steve Martin obviously has zero understanding of the reality of reproductive choice and what it means for women to have control over their bodies, families, and lives," Keene said. "His remarks demonstrate what exactly these extreme lawmakers mean when they talk about 'personhood' - that pregnant women are no more than vessels. Even more outrageous, he also fails to understand how he as a lawmaker can help empower women to reduce unintended pregnancies -- something that should be a common goal for all." This story has been updated with news that Martin changed his post and with a statement from Martin.